Having not read much Wolverine in the past, I went into ‘Wolverine: Old Man Logan’ with an open mind and a lust for blood. My previous knowledge of the infamous anti-hero is informed by comic book talking heads and the 20th Century Fox movie franchises which vary in quality vastly in my opinion. From the laughable CGI in ‘X-Men Origins: Wolverine, through the three-word character study in ‘X-Men: First Class,’ to the gut-wrenching highs and lows of the family drama, 'Logan', Wolverine has had a fair bit of exposure on the big screen. It's through the recommendations of many respected figureheads that I finally ventured into the paper back world of the X-Men and experienced Wolverine's plight first-hand. 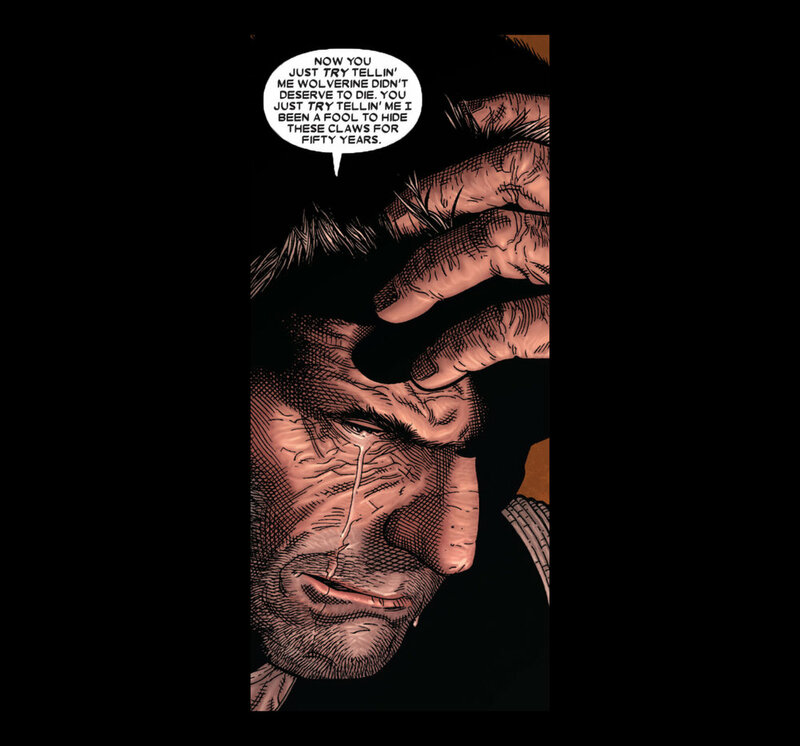 Mark Millar’s ’Old Man Logan' opens with a visibly aged Wolverine talking with his family discussing money problems while also having flashbacks to a younger, more recognisably spandex-clad and bloody incarnation of himself. As conversations migrate to the dinner table it's revealed that they owe rent money to a group of highly unreasonable and violent individuals with a surprising heritage; they are the grandchildren of Bruce Banner. When the green-neck Banner Clan turn up and demand payment (and and a beating), Logan appears to unsheathe his claws and have at it in a single blood-drenched panel, only to return to reality where his pacified self accepts his fate over the alternative. With a beating taken, Logan is next seen recovering in bed with a somewhat reduced healing factor, contemplating how to survive the looming threat of death over next month's doubled-up payment demands from the Banners. After a bedside visit from an old, blind Hawkeye ends in the offer of a well paid delivery job, Logan sees no other option but to take him up on his cross-country expedition in an attempt to keep the family threat-free for the foreseeable future. So, with a promise of some future security and a desire to know nothing of the details, Logan hops in the Spider-mobile and heads off across the Four Kingdoms with Hawkeye to deliver a package to New Babylon. I realise that last statement dives headlong into the unknown so let me explain. Fifty years ago America was victim to a mysterious incident and as a result was split into six regions, four of which are run by various super-villains. From West to East there's Hulkland, The Kingdom of The Kingpin, Doom's Lair, and The President's Quarter. On the mysterious "day that evil won" the super-villains declared America a lawless land and divided it up among themselves creating the provinces you see below. Our heroes have to cross 3000 miles of dangerous terrain from Sacramento to New Babylon and deliver the goods to Hawkeye's contact. As you can imagine, on their journey across the Four Kingdoms our travellers encounter many situations, all of which test Logan's pacifistic mindset, not helped by the constant goading by his wise-talking right-hand man. Every time Logan gets into a sticky situation his mild-mannered intensions get pushed to the limits, and knowing his past persona (of which you're constantly reminded), seeing Logan continue to suppress the Wolverine makes for a tangible tension that made me feel the claws could pop at any second. It’s when the duo embark on a side mission to Fisk Lake City that Logan gets more and more strong-armed in into making decisions that increasingly push him closer to claw's edge. One by one incidents stack up as flashbacks increase in length and intensity until it's finally revealed what events led to the demise of Wolverine and the rise of Logan. I’m a big fan of strong starts and this book had me from the opening page. It’s mysterious, bold and so blood-soaked you can taste metal as you read. Switching immediately back to the present day, the oscillating narrative swings throughout between the overly restrained, self-punishing, tortured soul of Logan and the animalistic, raw, and brutal nature of Wolverine. It’s when the flashbacks finally reach their peak and Logan bares all that it becomes clear as to why the claws have been subject to a 50 year ban. Steve McNiven’s art really does some heavy lifting here too by showing the haggard faces of these well-lived, beaten characters and using facial expressions to really drive home the suffering, pain and torment experienced by the lead characters. Not to mention, damn is it violent. Wolverine: Old Man Logan is a great but tragic book with some huge surprises that explore a different side of Wolverine. It shows a brutal, bestial man trying to do right after a series of events ruined everything he knew and has him making up for it ever since. 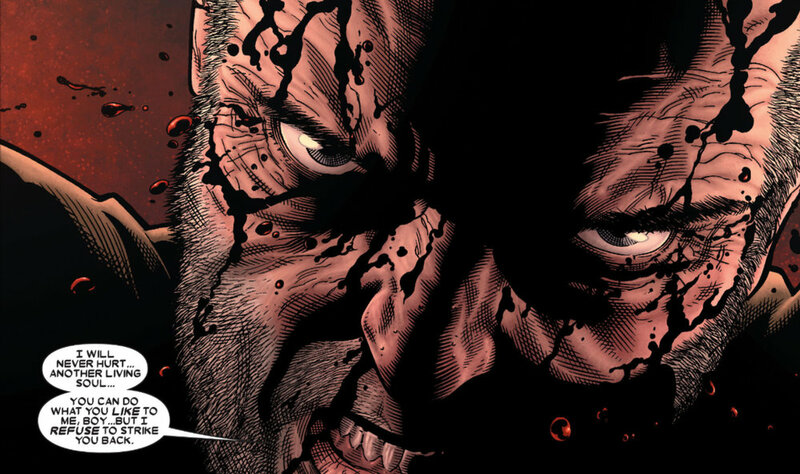 Wolverine: Old Man Logan is at its most interesting when the writing and the art combine to show our protagonist at odds with himself, holding back the primal urges to take action in the only way he knows how; through violence.